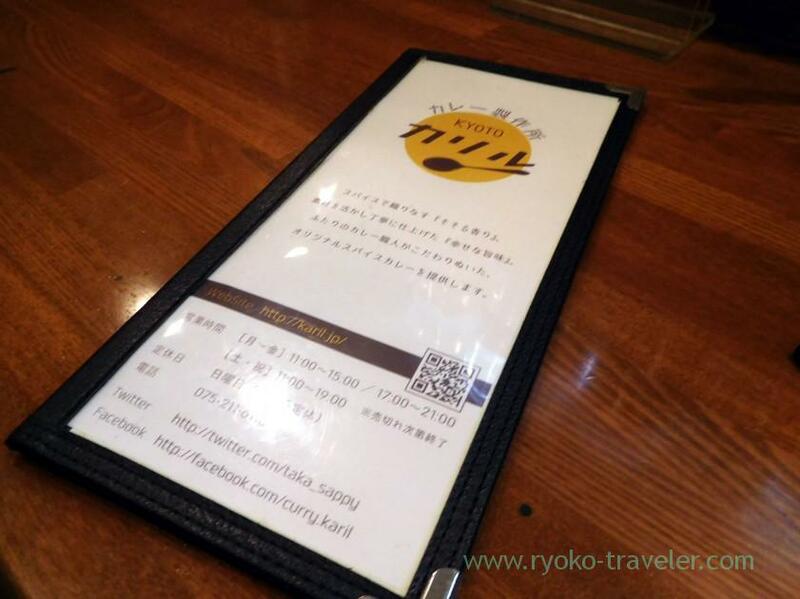 I visited “Kyoto Curry Seisakujo Kariru” to eat spicy curry in Kyoto. I got to there in time for the opening time (5 p.m.), so, there was no guest yet. There’s smell of spice outside ! 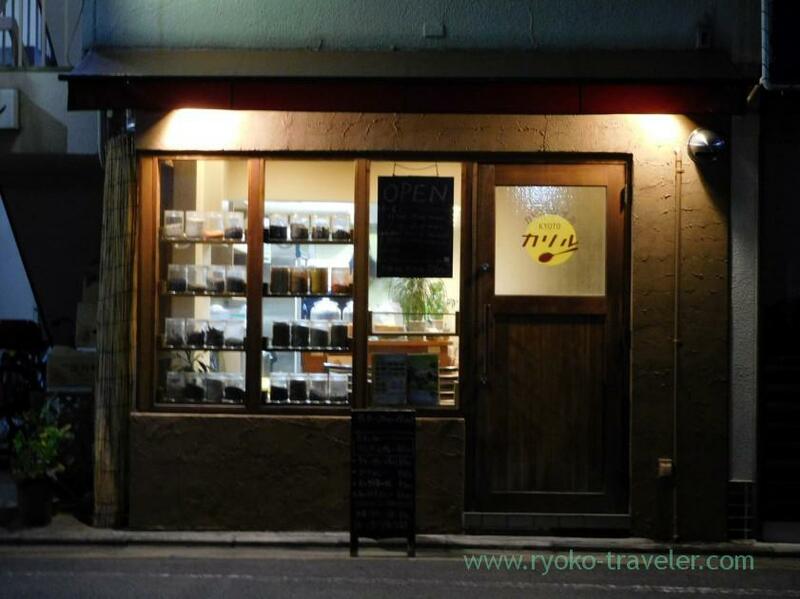 It takes about 5 minutes walk from Marutamachi station (metro). It’s close to Kyoto Daini Sekijyuji Hospital. Also it’s close to my accommodation. 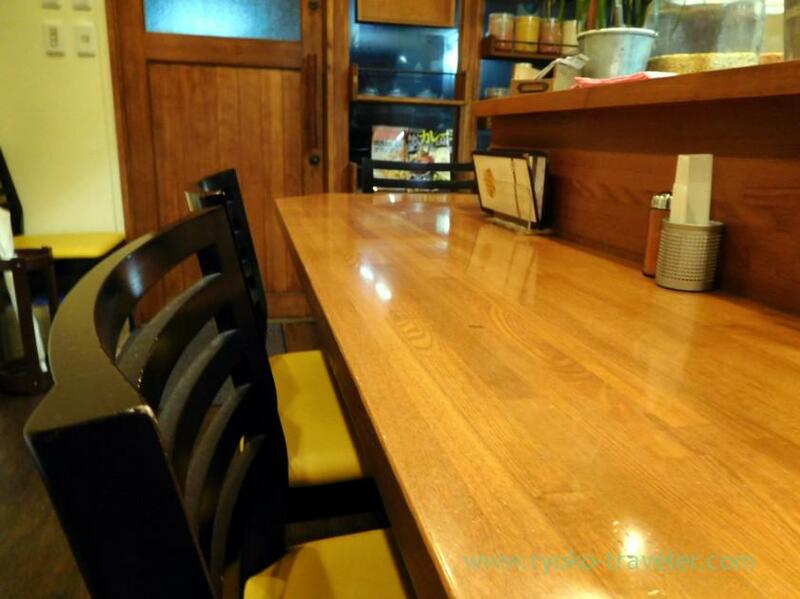 There’re counter seats only. The interval of each seats is rather wide. The house was filled with smell of spice ! They have started their business in 2015. There’s calm atmosphere and two chefs cook in silent. 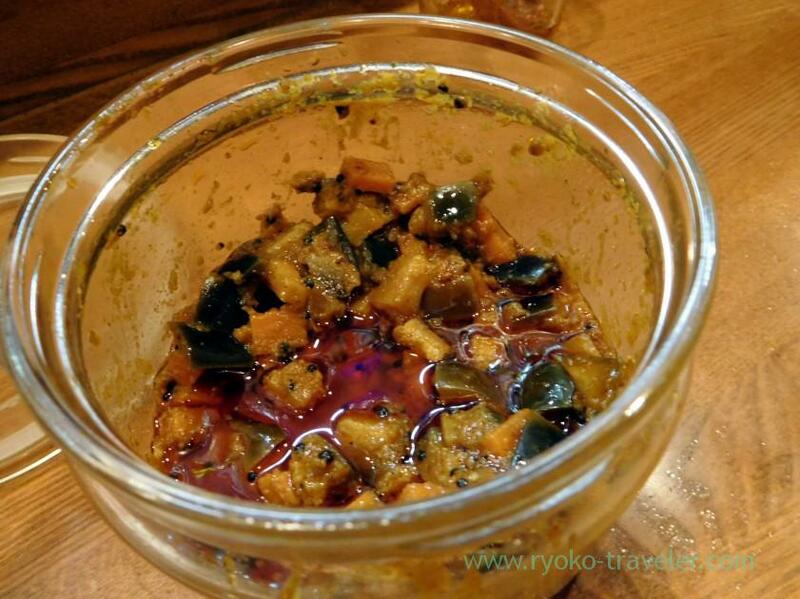 Achar and pickles are on the each tables. They give us a glass of water at first. And then we pour water into our glass from second helping. Kariru have regular menus. And another, they prepare special curry of month. It was Lamb meat and keema that time. I wanted to eat it, but I also wanted to eat regular chicken curry (spicy), so I ordered “Aigake”. Aigake is “Two curries on one plate”. 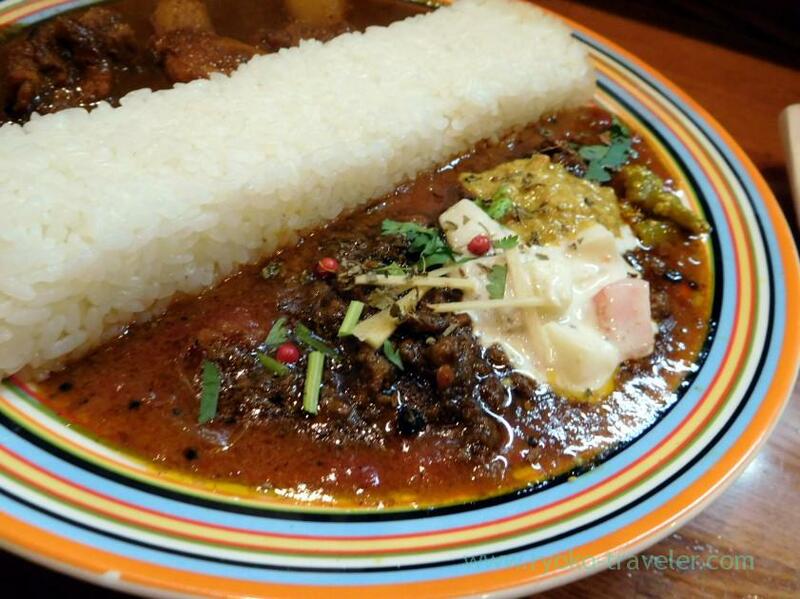 Lamb keema curry was 900 yen. 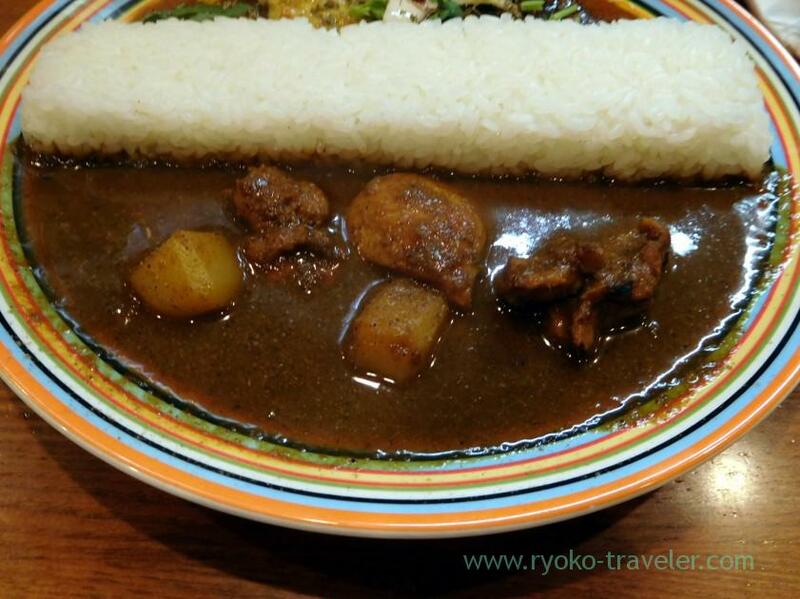 And Chicken curry is 800 yen. 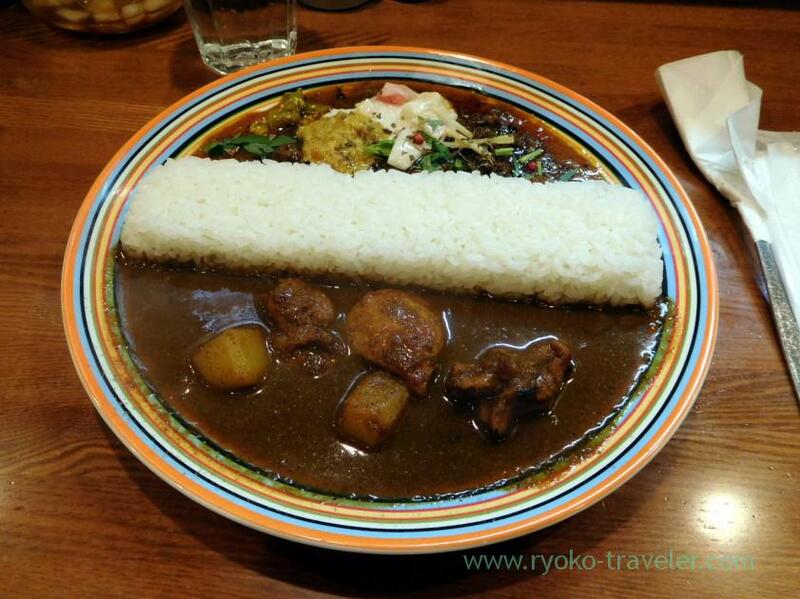 Aigake (Both is regular curry) cost 1000 yen. But I chose special curry of month. SO, it cost 1100 yen. So, I ordered it. Rice is at the center. And Lamb keema curry and chicken curry was dished up. The ingredients are simple. Potato and chicken, only. This is lamb meat and keema curry that is monthly special. It had coriander, cream, pink pepper and so on. COlorful and complex ! Somehow it tasted lightly sweet, though it’s spicy. 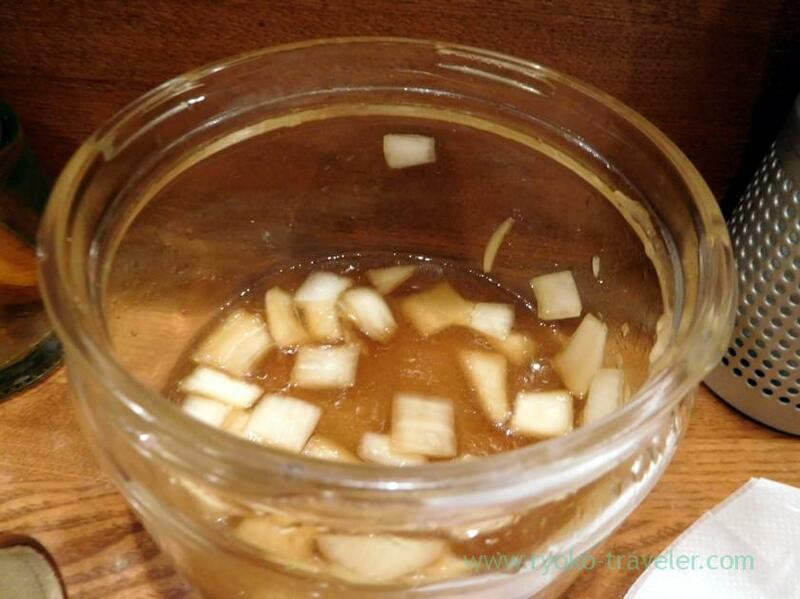 I like eating it like soup, not with rice. So, I eat rice with chicken curry. And I eat lamb meat and keema curry as soup. You can buy curry to go. So, it’s good to eat it in your room. Open / 11 a.m. – 3 p.m., 5 p.m. – 8:45 p.m. / Saturdays and another national holidays 11 a.m. – 5 p.m.
Narita Airpot : Free "SKY LOUNGE WA" on our way to satellite of terminal 2.